Albany track specialist Mass Effect came home with a wet sail to win today's Wayne McGlade Memorial Handicap (Race 8-1600m) and make it a winning double for SJ Wolfe Racing, after Red Moon's victory earlier on the card. 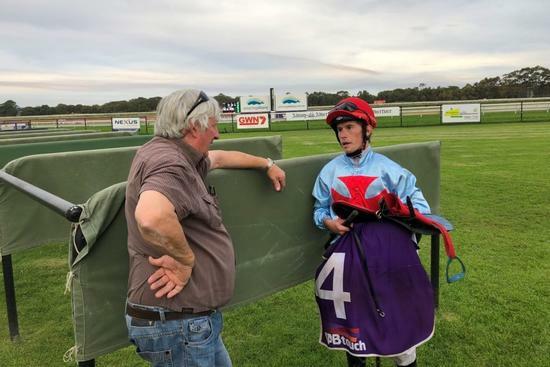 After jumping from barrier nine, the more-than-capable four-year-old was ridden patiently by up-and-coming apprentice Brodie Kirby early, before plotting a wide path on the turn and into the 'better going' towards the outside rail in the straight. From there, the son of Danehill Express let down impressively to run over the top of his rivals and claim his fifth win from nine starts at Percy Spencer Racecourse. The sparingly-raced Mass Effect was tested in graduation handicap company in town when last in work, acquitting himself well enough, but the stable is confident he will measure up in the city in 2018. Stable newcomer Red Moon was sent out a raging $1.50 favourite and didn't let his supporters down, controlling the race from out in front and recording a break-through win in the TABtouch Maiden (Race 1-1240m). The four-year-old son of Testa Rossa finished second at his first start for SJ Wolfe Racing at Albany on April 12, but was able to go one better with Shaun McGruddy getting the best out of him. Stablemates Democracy Rules and Hotline Bling both competed well and finished third and fourth respectively. Red Moon, who was originally trained by David Harrison, looks like a handy acquisition for the stable and is capable of banking another win before the Great Southern season finishes at Albany on Friday May 11.